Store Supply Warehouse offers a complete selection of matching display cases and accessories to give your store an entirely custom-built in look. This Gray Well Top Register Stand is the perfect way to complete your showroom's display presentation. Ready to assemble, the well top register stand provides a capable display piece for your cash register or computer screen. 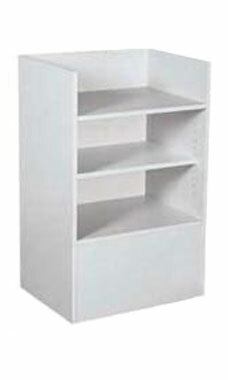 Featuring an adjustable rear storage shelf and a long wearing low pressure melamine laminate gray finish. Additionally, the stand has a 3/4" slab end construction. Overall measurements include: 38"H x 18"D x 24"L. Our well top register stand is the perfect way to complete your built-in display. In stock and available for immediate shipment. Factastic custoer service! Great product - Fast delivery - Very reasonable prices Could not ask for a better experience.